Gently toast all of the seeds in a non-stick pan until you can smell the aroma breaking free. 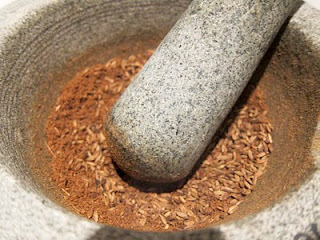 Crush in a spice grinder or with pestle and mortar with a good pinch of sea salt until you have a fine powder. 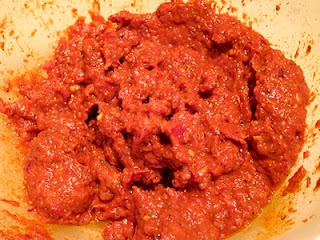 Add the powder to a container suitable for your hand blender (or whatever you use to purée stuff) along with the tomato purée, paprika, olive oil, roughly chopped chillies, peeled garlic cloves and unpeeled ginger. Blend everything to a fine paste and set aside. Ideally refrigerate overnight to allow the flavours to come out. Slice the onion, garlic and chillies. Cube the courgette and lamb. Melt the coconut oil, or heat the same amount of a flavourless oil, in a large frying pan or wok (whichever you have a lid for). Then add the onion slices and fry gently until the onion has softened. 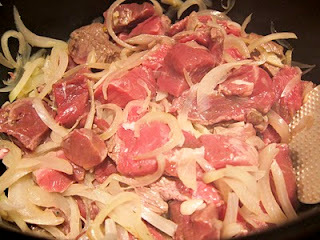 Add the the lamb pieces and cook until sealed on the outsides. 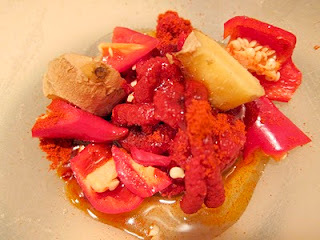 Add the chillies and garlic and warm through a bit more before adding the curry paste. Gently stir it all until the paste has softened and coated the lamb pieces. Add the balsamic vinegar and stir. Cook for 5 minutes until the lamb cubes are totally coated with everything and browned on the outside. Add the remaining raw vegetables and cook for another 5 minutes before adding the tinned tomatoes and stock. Bring to a bubble and then simmer, with a lid on, for at least 40 minutes. Notice the Becks Blue in the background - tastiest fake beer out there! Chills and freezes very well indeed and tastes even better when re-heated. So if you can stand it, make a batch and chill at least a day before you want to eat it.